Old map by BLAEU - Tractus Danubii, Fluminis in Europa Maximi, A Fontibus, Per Germaniam. . . Title: Tractus Danubii, Fluminis in Europa Maximi, A Fontibus, Per Germaniam. . . Size: 16.1 x 35.0 inches. Condition: Four joined sheets. Very good condition. No text on verso. Vertical foldings, as issued. 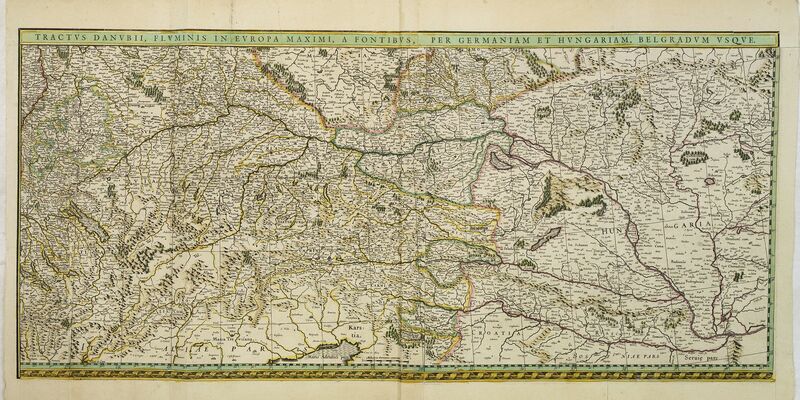 This is Blaeu’s first map of the Danube and surrounding regions. The Danube River runs through the map from the top left with its headwaters in the German Black Forest to the bottom right ending just past Belgrade in Serbia. A section of the Rhine River with Heidelberg, etc. is at the very top left. Vienna, Buda & Pest, and many other towns are identified. This map has numerous large and small towns on it, many more than on the Blaeu post-1635 map of the region (see below). This example is from the 1634 edition of Blaeu's Novus Atlas. For some reason, Blaeu only issued this map in the 1634 and 1635 editions of his atlas. This map was replaced in a later 1635 Latin edition with a new map that appeared in various Blaeu family atlases until the final Spanish edition of the Atlas Maior of 1672. Thus, this map is rare. Further, the large size of this map also resulted in numerous examples being lost, as it was more difficult to protect such a large map in comparison to his smaller folio-size maps. Blaeu was quite anxious to issue his first terrestrial atlas, with the pending issue of an atlas by his competitors, Henricus Hondius and Joannes Janssonius. As such, he wanted to include a map of the Danube in his atlas, but did not have yet have copper plates prepared to print a map of the Danube. Thus, he used the three bottom copper plates from his famous and extremely rare, large wall map of Germania (and central Europe) of 1612. The center and right bottom wall map sheets form the main part of this map, he used only a 5.5cm strip from the wall map that he attached on the left side to show the sources of the Danube in the Black Forest of Germany. Blaeu also attached a separate title strip across the entire top of the map. In addition to the map's rarity, this use of the Blaeu wall map copperplates makes this map unusual. Willem Janszoon, or Willem Jansz Blaeu (1571-1638) as he is more commonly known, was one of the most noted Dutch cartographers and map publishers of the 17th century. R.V. Tooley stated that Blaeu's maps are "esteemed by collectors for their decorative quality, historical importance, and as the highest expression of Dutch cartographic art during the period of its supremacy" (Tooley, p 28). After preparation as a pupil of the great Danish astronomer, Tycho Brahe, Blaeu initially concentrated on globe making and separately published maps, including wall maps of the continents. From 1608, he dominated the market for sea atlases and in 1630 produced his terrestrial atlas. These atlases were continued by his sons, culminating in the great Atlas Maior of 1662 in 11 volumes with subsequent editions. Reference: Van der Kogt, Peter. Koeman's Atlantes Neerlandici. vol.II, p.487..